BONUS UPDATE: It’s the day after Budget Day, and what the heck does this mean? The nation may be abuzz with debate about whether the chancellor’s change to National Insurance for the self-employed is retribution against the wealthy and their artificial “service companies” used to avoid tax, or an attack on the working-class independent contractor – the Sun’s beloved “White Van Man” – at a time of economic upheaval. But never mind that. By far the most pressing question of the day is: is this a flying verb? Scarcely two days after this blog made the confident assertion that flying-verb headlines would never be seen in Britain as they used to be, decades ago, in American tabloids, up pops the Sun with something that looks an awful lot like… well, what is it? 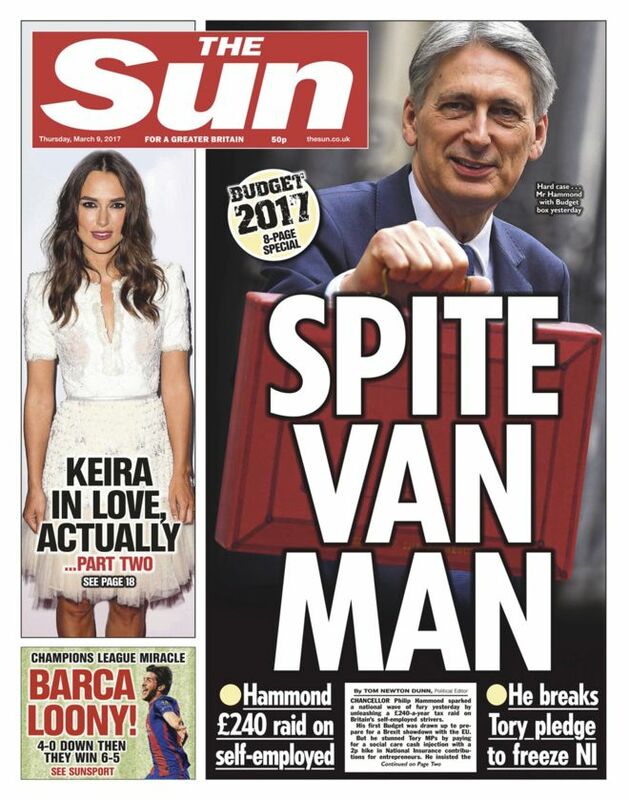 It’s not an adjective: “spite van man” might be an acceptable pun to refer to a van-driver who has done something unpleasant or vicious, but that’s not the story here. It’s not, similarly, an imperative: the article isn’t calling for retribution, simply analysing the news. Is the chancellor himself, in the picture, being described as the “spite van man”, perhaps? Hard to see how: he doesn’t have a van, nor is he spiting the vehicles themselves. And look at the first standfirst: “Hammond £240 raid on self-employed”. Doesn’t that tempt you to believe that the sense is “Tories spite van man” – that the subject of the sentence has been deleted, leaving the verb to fly? Perhaps not, in fact. The likeliest explanation is that it’s a simple rhyming pun that ultimately fails to mean anything: a bit like the baffling (and much-criticised) “NOD IN MY NAME” front page the Sun ran about Jeremy Corbyn supposedly not bowing sufficiently at the Cenotaph. That was a familiar pacifist phrase with one word altered to fit the news, but not something you could actually parse for sense. But on a day when even the Daily Star (“ROB THE BUILDER!“) is running strange, agentless Budget headlines on page 1, you’re entitled to wonder if an old headline form is lumbering improbably back to life. Who exactly is doing the robbing? UPDATE TO THE UPDATE: Day 2, and I think this idea is approaching the end of its development curve. Still, at least it’s clear that this one’s an imperative. ← Is it a verb? Is it a plane? Yes, I agree: to construct it that way round you really need quotes round the first bit. And even then you might as well put it the other way round!